Colored corundum (aluminum oxide) is called sapphire, which can be found in nearly all the colors of the rainbow. The darker hues of red sapphires have been given a class of their own - ruby. Ranging from pink and purple to brownish red, rubies and other pink sapphires have one thing in common: the chemical element chromium. The strength of red in a ruby directly correlates to the amount of chromium in the crystal. 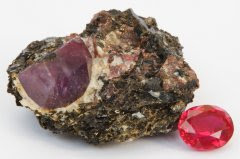 A corundum crystal absent chromium will not possess the red quality, so even pink sapphires have a small amount of chromium. Though there are not clear industry standards to establish when a pink sapphire becomes a ruby, generally speaking, the darker the hue of a ruby, the more valuable it is. Rubies can also be reddish brown. The presence and strength of brown tones directly correlate to the amount of iron replacing small portions of aluminum in the crystal. These iron-infused rubies are still prized, but not as much as true red corundum. Strength of color in rubies is the primary determining factor for price, though size also plays a role. However, since chromium naturally inhibits crystal growth, it is rare for rubies to be more than 10 carats. Though these tiny gems are small, the rarity and hardness of red corundum make them equal to, if not greater in value than diamonds. 1. Smigel, Barbara. "Ruby: July's Birthstone." Gem Society. Accessed May 21, 2012. http://www.gemsociety.org/info/gems/Ruby.htm. 2. Oldershaw, Cally. Firefly Guide to Gems. Ontario: Firefly Books Unlimited, 2003, 64-66. 3. Spignesi, Stephen J. Gems, Jewels and Treasures: The Complete Jewelry Book. West Chester: QVC Publishing , 2001. 4. "Synthetic Ruby." Accessed May 21, 2012. http://www.enotes.com/synthetic-ruby-reference/synthetic-ruby. Enjoyed catching up on your ruby articles--interesting and well written. How do rubies compare to garnets in formation? That is a very good question. I will research it and get back to you!